Right in the heart of the Odenwald lies our well-kept, parklike camping site in a very quiet location at the periphery of Hammelbach. The site is situated in an area ideal for hiking and is surrounded by forests and valleys that allow a marvellous distant view. Well marked footpaths take you right from the camping site through a hiking paradise where new views ever await you. Or you may explore the area on diverse paths by bicycle. Mountain bikers will find stretches of all degrees of difficulty. 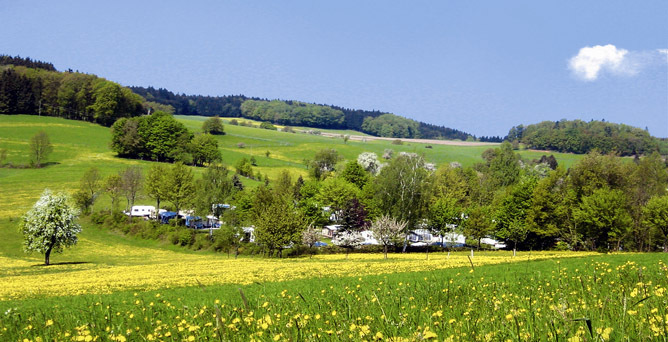 Our well maintained, park-like campground is situated in a very quiet location right in the heart of the Odenwald, just on the outskirts of Hammelbach. Ideally, the campground is surrounded by forests and valleys offering numerous well-marked hiking and biking trails with spectacular panoramic views. Mountain bikers will find highly varied stretches of trail with all levels of difficulty. Whether hiking or biking, come enjoy the beauty of the Odenwald.